Spring is in the soil as well as in the air here on Sark encouraging the black oil beetle, one of our most spectacular insects, out its burrow where it’s spent the winter hibernating. These beetles have an extraordinary life cycle – they are nest parasites of solitary mining bees. The females lay their eggs in underground burrows. When they hatch each larva climbs up on to a flower and waits to hitch a ride on a suitable bee that carries the larva back to its nest burrow. The beetle larva feeds on the bee’s eggs and its store of nectar and pollen then develops into an adult beetle ready to mate and start the cycle again. 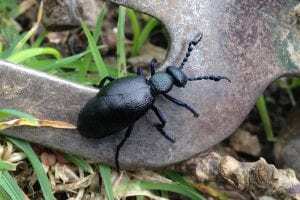 Oil beetles are becoming increasing rare in the British Isles, especially further north, and are an important indicator of healthy, flower-rich grassland habitats.